Social media is turning the world of marketing upside down. Companies can no longer simply “shout out” and have one-way conversations with their customers. Today, dialogues are not only two-way, but also customers are reaching out to colleagues and trusted advisers on social networks for brand information. In fact, most B2B buyers prefer to conduct their own research first to learn about a company`s product or service offerings than rely on a customer representative. The vast amounts of content available online, along with ubiquitous Internet access and high bandwidth make information gathering and sharing standard practice today. Buyers are simply more social. A review of published research indicates there isn’t a tidal wave of social media activity in the B2B buyer ecosystem, but nevertheless marketers are taking notice and preparing for the growing adoption of social networking during the purchasing cycle. Search and old fashioned “word of mouth`are still dominant behaviors for information gathering, but social media activity is growing—particularly, as a new generation of socially savvy buyers comes on board. It will no longer be “phone a friend” for help. An IBM Chief Marketing Officer (CMO) global poll showed staggering adoption rates for social media technology of 82% in the next 3 to 5 years. Traditional “interruption marketing” tactics such as advertising, events, and telemarketing are slowly giving way to inbound marketing activities such as social media. Business Insider has reported that ad spend in the US, by quarter, on Facebook is $992 million, Twitter is $65 million, and Linkedin is $63 million. This translates into a total annual ad spend of $4.5 billion on social media—14% of all US online ad spending ($32 billion). Yes, $4.5 billion is a relatively small proportion of online ad spending and even more so when looking at the more than $160 billion being spent in aggregate in the US; but social is a relatively new channel and will continue to gain traction. What social media channels is your target audience actively participating in? This will give you a better idea of how your customers may engage with you. What are your goals? For example, this can be externally oriented for marketing or sales purposes; or for internal reasons to improve employee collaboration. How do you want your relationships with your customers to change? What exactly do you want them to do? What social media channels will you be using? After you determine the people, objectives and strategy, it’s a lot easier to identify the appropriate technology for your strategy and objectives. Should it be a blog, social network, wiki, or other social channel? 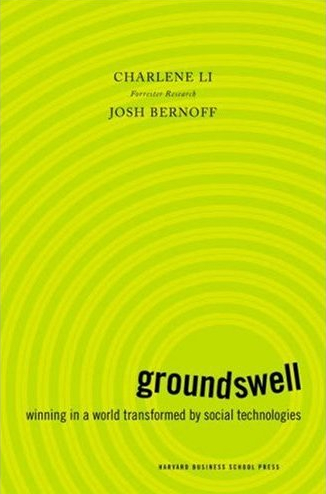 Listening: The groundswell can be used for research by monitoring customer conversations with each other. Talking: The groundswell can expand digital marketing by introducing platforms that encourage two-way conversations among customers. Energizing: Locate your brand enthusiasts and encourage them to help sell each other; the power of word of mouth. Supporting: The groundswell can help companies reduce support costs by enabling customers to support each other. Companies can also use social channels such as Twitter for more immediate and responsive customer service. Embracing: The groundswell can help your customers work with each other to come up with new product design ideas. Customers can be integrated into the way your business works. The groundswell has indeed arrived! Companies that embrace the groundswell will emerge as industry leaders in the new marketing environment—it begins with content, followed by conversation and engagement, and ultimately, conversion. It`s time to listen to your customers and participate in the conversations. I wonder how many of you are listening? This entry was posted in Social Media and tagged Forrester Research, IBM, social media marketing by irvingfrydman. Bookmark the permalink.